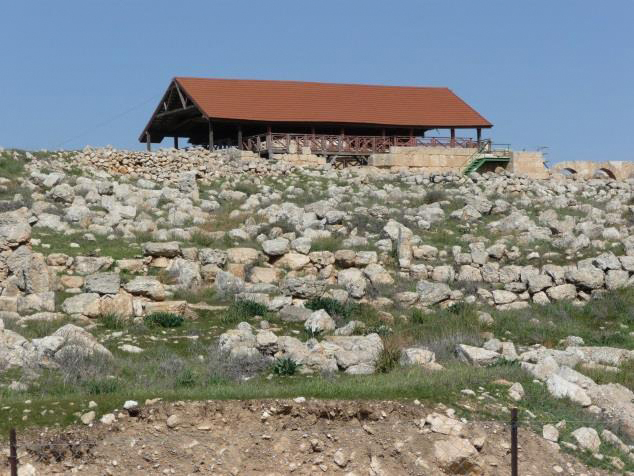 Where does the buck stop in the South Hebron Hills? Israeli PR typically portrays the army of occupation (IDF) as acting in the interests of security, when it is really confiscating property in the interests of settlers. In area described in this paper, IDF has no such "security fig leaf", because Palestinians resist in an entirely peaceful manner. At the end, I ask who is really responsible for the lamentable situation faced by the people, even as they resist peacefully. 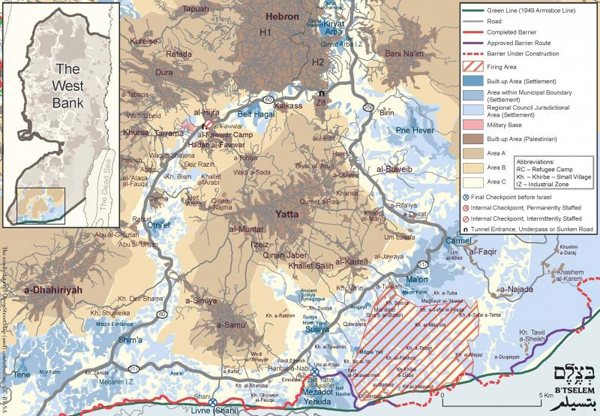 the designation by the Israeli army (IDF) of the large Massafer Yatta zone (33,000 dunums or 33 square kilometers) as a “live” army practice firing area, around the year 2000, and the consequent demand for the forced displacement of 1,300 Palestinians living in 8 hamlets. The constant pressure of settlers, both religious elements seeking to recreate Biblical Judea, as they see it, and economic migrants seeking better value for money in terms of housing. The actions of the military often work in benefit of settlers, throughout the West Bank, since land originally appropriated by the army is very often re-allocated to them. Added to this, the local inhabitants face an Israeli military legal system governing “Area C” that (while providing some scope for appeals, injunctions etc. against the actions of the army and settlers), is biased towards the interests of the latter. Taken together, army, settlers and Israeli courts create a climate where local people can be progressively dispossessed of their land, their houses and their livelihoods within a legal framework recognised in Israel, but nowhere else. a range of NGOs, like Action Against Hunger (ACF), GVC, Norwegian Refugee Council, Cesvi and, notably, the Hebron International Resources Network (HIRN). Israeli dissidents, notably Rabbis for Human Rights, B’tselem, Ta’ayosh, the Association for Civil Rights in Israel (ACRI), and the Israeli-Palestinian Villages Group. The “Villages Group” holds Thursday meetings with Palestinians at different locations throughout the South Hebron Hills. some support from the UN and bilateral donors. There are also “internationals” who, though not involved in the conflict, bear witness to demolitions and other events and try to provide protective presence during times of hardship. 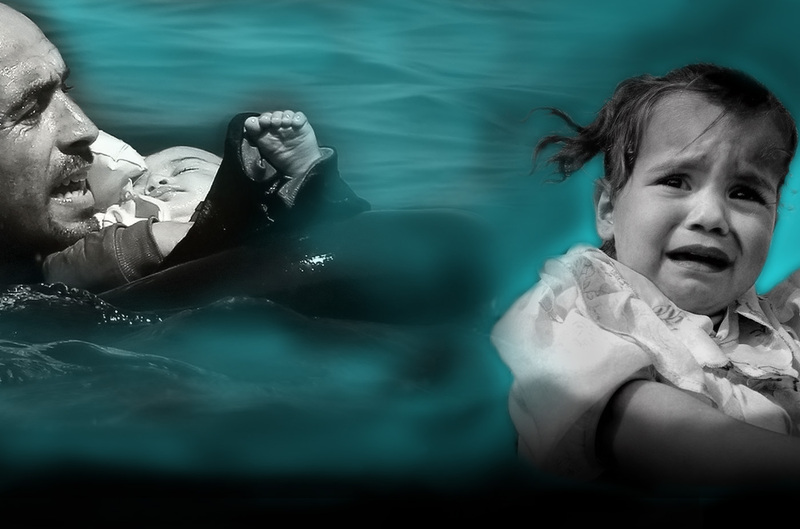 These organizations include the World Council of Churches-sponsored Ecumenical Accompaniment Program in Palestine and Israel (EAPPI), the International Solidarity Movement, Operation Dove and the Christian Peacemaker Team (CPT). We visited three communities, in Area C, but outside the Massafer Yatta zone: Susiya, Um-al-Kheir and nearby Zweidin. I briefly recount what I learned in these villages, then discuss the Massafer Yatta zone, and end with some concluding remarks. Part of the existing Palestinian community was located on an archaeological site that Israel has determined to be an ancient synagogue. In the year 1985, the Israelis had cleared the dwellings around it, fenced off a large area round the site, and prevented the Palestinian original residents from accessing it while transforming the site into an archeological park to which Palestinians are not allowed. The evicted Palestinians moved into what used to be their agricultural lands across from the original Susiya in the hope that, one day, they would be able to go back to their original dwellings. That, however, did not take place. 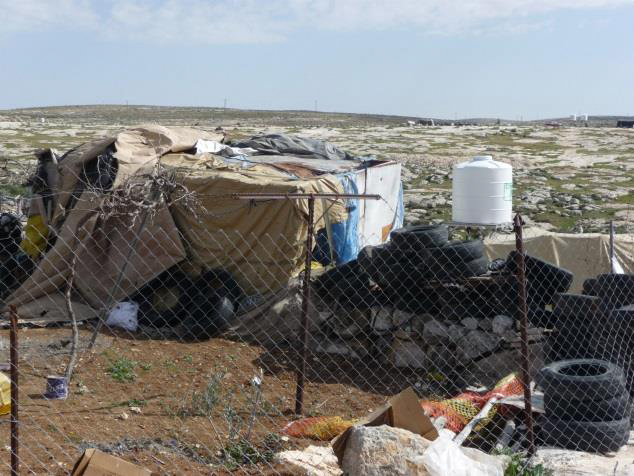 Rather, the Israeli authorities have continuously attempted to demolish the “new Susiya” in an effort to link the Israeli settlement of “Suseya” (established in 1982 on private Palestinian lands) with the archaeological site. The Palestinians of Susiya have experienced around five separate demolitions after which they have rebuilt, often with support of NGOs. They recently learned that 40 of the community’s structures could be demolished again without notice. Rabbis for Human Rights (the Israeli organization defending the existence of the Palestinian Susiya) were taking up the issue with the military Court, so as to delay any decision, buying a “stay” of 2-3 weeks. This may need to be backed up by the “protective presence” of international observers. 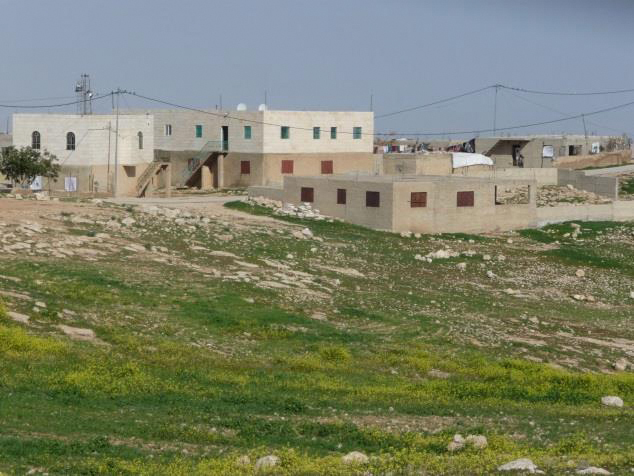 It was mentioned that the villagers need an organisation to sue the army for the 43 Israeli structures that it has allowed the settlers to build on what is Palestinian private land in the vicinity of the nearby settlement of “Suseya”. This happened with the settlement of Beit El (near Ramallah), where the High Court ordered structures to be demolished due to the fact that they were built on private Palestinian lands. However, the Palestinians face a difficult choice here, because the Court could well insist on parity in demolitions, so that an equal number of local structures will be equally affected. The Bedouin people came here in 1952 after being expelled from Israel in 1948. Under the Occupation, they have title deeds to the land but may not build without a permit. 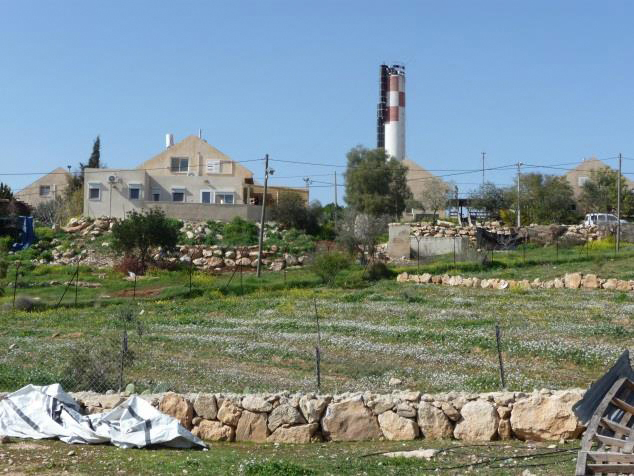 The Israelis have built the settlement of Carmel adjacent to the village, along with a dairy plant and a poultry farm. The Palestinian village is in the path of the settlement’s planned expansion, and it wants the villagers’ land as well state land on a hill at the back, so they can put up 60 more housing units. As a consequence, the village has been the object of 6-7 demolitions between 2007 and (October) 2014. Paying for 7 students to attend college. In its overall zone of operation, the Villages Group has paid for the tuition of at least 21 students (male and female) from communities deemed vulnerable due to their close proximity to settlements and the harmful impact of Israeli Occupation policies. The income from the thyme and eventually olives will be used to generate income for community purposes. Exporting thyme products to international markets are also considered. The project has planted 8,000 thyme saplings in all the villages, and it is planning to plant olive saplings in the near future. Here the situation is much more favourable, as this Bedouin village has a “Master Plan” that provides for zoning of streets, electricity, a water network etc.. Villagers are free to build here, but there is still a snag that the Master Plan doesn’t provide for expansion in line with population, or to absorb the extra people who move here after being expelled from other villages. At Zweidin, Palestinian villagers have built permanent structures without fear of demolition, but will there be space for expansion and new arrivals? Here, HIRN has helped the community establish a school for girls, with two classrooms and lab equipment. It has carried out a fundraising activity involving a half-marathon to raise the funds for the two additional classrooms in an effort to stop female students from dropping out of school. Zweidin experiences a high drop-out level for young girls after the 6th grade due to the mixing of sexes in the school. Additional support came from a multitude of individuals that enabled HIRN to purchase chemistry, physics and biology labs for the school. Since 2000, the army has wanted the Palestinian residents of Al Massafer out, but the situation rested in limbo for 12 years. In 2012, a judge submitted the matter to mediation. Recently the mediation process failed, but it appears that the relevant authorities did not divulge this to the villagers or those supporting them. The army then went back to court and got an order to demolish 33 structures. Without any forewarning, they turned up at 5.30 in the morning of 2 February 2016, and demolished a total of 24 structures, 15 in the village of Jinba and 9 in Al Halaweh. They also “confiscated” 5 solar panels. The remaining 9 structures are to be demolished within the next week, but the legal NGO, St Ives, will go to court to press for a one-month extension. It was mentioned that American, Spanish and Norwegian diplomats had recently visited the villages of Al Halaweh and Jinba, for this reason it is hoped there will be no more demolitions in the Massafer Yatta area. Sensing the danger of forced displacement facing the Palestinians, HIRN along with a multitude of other organisations decided to provide a series of services to the residents of the area, including in the area of education. For example they were able to provide Jinba school, one of three schools in the area, with 2 laptops for use in the classrooms for internet-based classes and for presentations, an internet connection and a camera to document any Israeli violations in the vicinity of the school. It was mentioned that one of the difficulties in the Massafer Yatta area is that it had proved more difficult to achieve proper representation of the local people than had been the case with communities outside of this area. The Israelis are seeking, gradually but implacably, to dispossess the Palestinians of most of the land and sources of livelihood in the zone, making use of planning laws which they set unilaterally. The powers at their disposal enable them to do this even when, as is often the case in this zone, the Palestinians have secure title to the land – not simply customary rights. There is strong resistance on the Palestinian side, but this involves a long drawn-out cat-and-mouse, where each side searches for different ploys to outfox the other. As we can see above, the Israelis use expedients like offering cash to locals who will sell up, using the “confiscation procedure” and demolishing homes without notice. For their part, the Palestinians have planted on land in front of settlements (creating their own “facts on the ground”), taken out injunctions to delay demolitions, supported rebuilding of demolished structures, built structures for guarding land under threat of seizure and have installed pre-fabricated structures. All this demands enormous effort and vigilance on the Palestinian side, with the prospect of, at best, mitigating the enormous injustice involved. Notwithstanding we can only admire their commitment, diligence and tenacity, and the steadfast support from organisations like HIRN. Notwithstanding the considerable outside support for the resistance and the recent visit by foreign diplomats, the whole situation is a dreadful indictment of the international community and particularly Western powers. This is particularly the case with countries like the UK, France and the USA that have given Israel a virtually free hand to pursue the Occupation since 1967. The USA moreover massively supports the IDF which is the main agency implementing the Occupation, giving more aid to Israel than to the whole of Sub-Saharan Africa. Hence my message to the people of the UK, US, France etc. is that the buck stops with us. It is we who have caused this mess, by a combination of actions and inactions since the issue of the Balfour Declaration in 1917, and particularly since the Occupation of the West Bank in 1967.